Where I Got It: I got the e-ARC from netgalley.com, which hasn’t influenced my review in any way. Promise! When I first started reading Me Since You, I wasn’t sure about it. But as I kept reading, I found that it was a hard book to put down. I got so wrapped up in Rowan’s story, and one choice changed her entire life, and I really felt for her. If I had to describe Me Since You in two words, it would be ripple effect. Rowan skipping school set off a series of events that led to do her dad’s suicide. We see a little bit of her life before it happens, and you really see how much it changes her and the effect that it has on her. Rowan struggles with guilt and blames herself. I don’t blame her- in fact, I would probably feel the same way if I were her. I couldn’t help but cry, and I was a sobbing mess by the end of the book. I could relate to Rowan so much, and I really liked seeing her start to come to terms with everything that happened. This is definitely one of the best books I’ve read about a teen grieving. Something about Rowan’s story rang true- whether you’ve lost someone to suicide or not, I feel like her grief is something everyone can relate to. One thing that frustrated me was Rowan’s best friend Nadia. She pretty much told Rowan that she needed to get over her dad’s death a few weeks after it happened, and pushed Rowan to go to parties, only to be really frustrated when Rowan doesn’t enjoy herself at said parties. I really wish she were more understanding of what Rowan was going through. I suppose it can be hard to understand when you haven’t been through it yourself, but I was just irritated and frustrated and angry that Rowan’s “best friend” thought she wasn’t getting over her father’s suicide fast enough. I did like Eli and Daisy, and I’m glad Rowan had a friend in Eli. He really did understand what she was going through, and I’m glad Rowan had him as a friend. I loved Me Since You so very much. One moment can change everything, and Rowan’s life is so very different because of it. I found Rowan really easy to relate to, and I really felt for her. 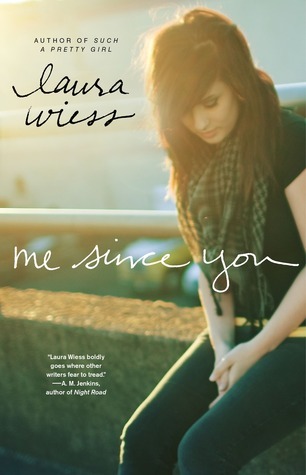 Me Since You is a really special book- I couldn’t help but want her to be okay. Me Since You gets 5+ stars. Perfect summary. This book is definitely a wreck-the-reader book.